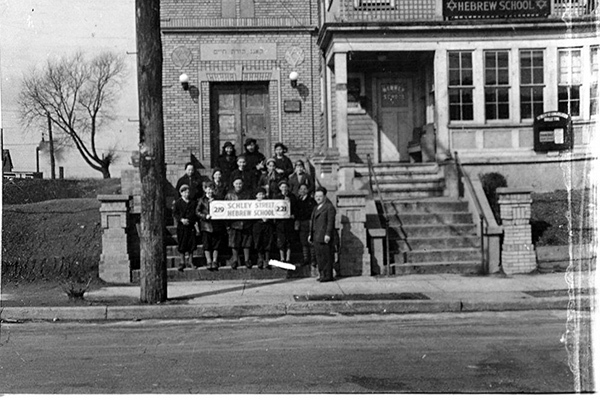 Weequahic’s residents identified their synagogues by the streets they were located on; Rabbi Herman Kahan’s synagogue, Torath Chaim Jewish Center, was called the Schley Street Synagogue. As she began an hour-long trip down the Jewish memory lane that was the Weequahic section of Newark, the executive director of the Jewish Historical Society of NJ made a confession. “I was, alas, not born at Beth Israel Hospital and did not graduate from Weequahic High School. The best I can claim is that my bat mitzva dress was purchased at Bamberger’s department store,” said Linda Forgosh, who grew up in Woodbridge. Her anecdote-laden lecture, “Newark’s Jewish Frontier: Weequahic and its High School,” began, of course, with a bit of history via a 1913 real estate ad from the Newark Sunday Call projected onto a movie screen. It offered “cheap high-class building plots” in an area builder Frank Bock named Weequahic after a Native American tribe. The houses featured in the ad ranged in price from $2,500 to $3,500, with only one street allotted for commercial use. It also proclaimed in bold letters — NO SALOONS. As she displayed a photograph of vintage street signs, the first in a series of collective sighs came from the audience. Many of its members were born at what was then Newark Beth Israel Hospital and graduated from Weequahic High School as far back as the 1940s. She showed an art deco apartment building on Lyons Avenue that was home to both Newark’s only Jewish mayor, Meyer Ellenstein, and its most notorious Jewish gangster, Abner “Longie” Zwillman. Among their more noble deeds, Zwillman’s colleagues provided security for Weequahic High School athletes when they traveled to away games in parts of Newark that were less hospitable to Jews, she said. On one occasion, as Forgosh told it, eight-year-old Bobby Goldberg was spotted smoking a cigarette several blocks away from his home on Pomona Avenue. Food was a potent trigger for happy memories among audience members, as Forgosh scrolled through photos of Syd’s Hot Dogs, Cohen’s Knishes, Watson’s Bagels, the Weequahic Diner, and the upscale Tavern Restaurant, not to mention the original Eppes Essen — now in Livingston — and Tabatchnick’s “the Herring King.” And, of course, she showed an example of what was a staple of local Jewish life, Ming’s Chinese Restaurant. “Syd’s sold the best hot dogs,” Forgosh insisted. “Just ask the scores of young men who ran past Syd’s during high school gym class every day. It was routine to disappear into the luncheonette, grab a hot dog, and — if the coast was clear and the coach didn’t spot them — get back into the group of runners. On a more serious note, Forgosh displayed a full-page list of Newark’s synagogues from a 1962 issue of the Jewish News. 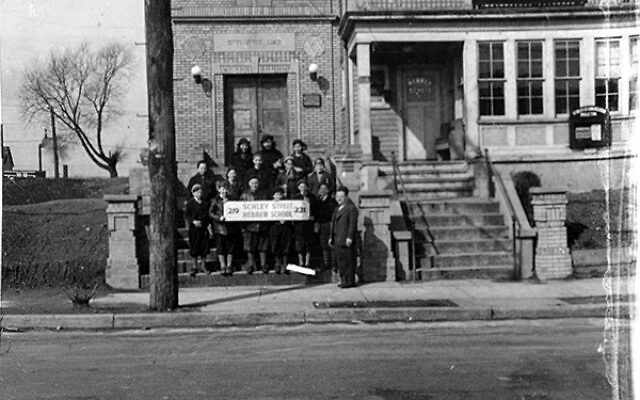 “Of the 43 small neighborhood synagogues located in Newark at this time, 16 were in the Weequahic neighborhood. Synagogues occupied nearly every third corner,” she said. Weequahic High School “was a neighborhood school,” said Forgosh. But for those who lived outside the area, there was one way they would be allowed to transfer — by expressing a desire to learn Hebrew in the only Newark high school where it was taught. White migration from Newark to its suburbs changed its demographics, and Weequahic’s current student body is largely African-American and Latino. To maintain continuity between current and former students, graduates Hal Braff of South Orange and Sheldon Bross of Bloomingdale formed the Weequahic Alumni Association in 1997. “It has been a major success — raising hundreds of thousands of dollars for scholarships and activities for today’s Weequahic students,” Forgosh said. During a question-and answer period, an African-American from the class of 1976, Andre Francis III rose to thank his fellow alumni from earlier generations.